This collection of free calligraphy fonts compiled by WebDesignDev from Fonts2U is a surefire hit for your computer. These artistic fonts can amp up your presentations, graphic designs, invitations, business cards, and many more; definitely a must-have collection for graphic designers and enthusiasts. Packed with traditional scripts to exquisite-looking calligraphic arts, these fonts can easily express your desired thoughts and messages just by their artistic strokes. Cygnet Round – it looks just like the handwriting of a really careful lady, don’t you think? 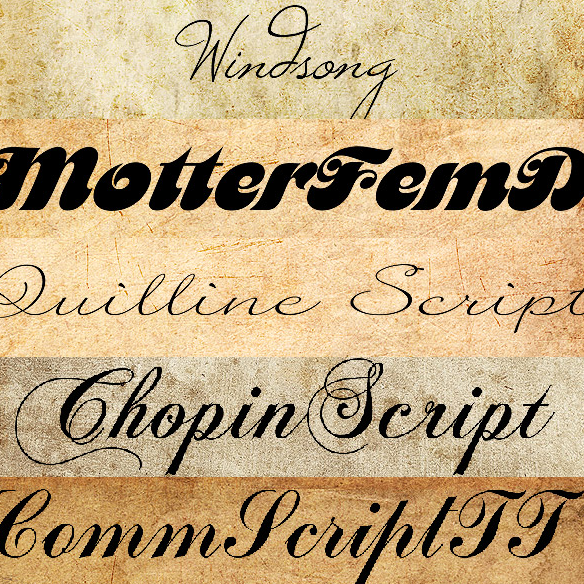 Chopin Script – perhaps you recognize this one as the font used in the famous Chopin vodka; it tastes yummy, though. Champignon – this font is perhaps one of the most formal looking; would look great on invitations with its intricate capitals and smaller lower caps. Motter Fem D – bold and strong; it reminds you of the Austin Power font, too. You can download them one by one from WebDesignDev or by clicking on the links above. Louie Mantia Icons and Wallpapers – spice up your Windows or Mac desktops!